This giveaway is now closed. View the winner here. Thank you all so much for entering! This is a lightning-FAST giveaway that ends THIS FRIDAY, Dec. 10, to allow you ample time for holiday shipping, so enter quickly! Picaboo is offering my readers a giveaway of a 20-page Classic photo book! Picaboo offers customized photo books, cards, and calendars, any of which would be perfect for holiday gifts and treasured keepsakes! One lucky winner will receive a coupon for a free 20-page Classic photo book, valued at up to $39.99. Please note that this giveaway prize coupon does NOT include shipping costs, which allows us to open this giveaway internationally. Shipping from Picaboo starts at $7.99 for ground shipping to the continental United States. The winner is responsible for verifying and paying shipping and any surcharges to the applicable destination. Classic Linen books feature a traditional photo book design with a die-cut window on the front cover, allowing your image and caption from the first page to show through the cover when the book is closed. Classic Custom hardcover books add a "wow" factor and a professional touch to your book with a completely customized cover that really makes an impact. Create a one-of-a-kind cover featuring the layout, background, images, and text of your choice on the front cover, back cover and spine. Classic Leather books have a rich, smooth finish and formal, timeless design that speaks to their lasting quality. These covers are easier to care for than the Classic Linen, which can show fingerprints and other markings more easily. Creating photo books with Picaboo is easy and fun. Photo books can be fully customized by dragging-and-dropping photos and captions anywhere on your pages, and Picaboo's easy software allows you creative control so you can make each special page look just the way you want it to. This coupon is good for one 20-page Classic photo book in any style. It does NOT cover additional pages over 20. It does NOT cover applicable shipping costs. The coupon will expire on December 30, 2010. The ground shipping cutoff for the continental United States (to have your book by Christmas) is Tuesday, December 14. Picaboo currently ships to the listed countries. Please verify shipping price and availability before entering if you require international shipping. I haven't used Picaboo's software or printing yet, but Sam and I have made photo books for several years now from a couple companies. They're a perfect way to organize and show off your favorite photos and preserve them professionally for generations to come. This year, as in a past Christmas, we've put together a charming collection of photos of our adorable Mikko and ordered several copies: one to keep, and one each for the grandparents and a doting aunt. Back when we were the doting aunt and uncle, we put together a photo book of our niece's first two years to give to her parents and grandparents. We also arranged our favorite artsy shots of Seattle, for our own enjoyment and to display for visitors. Every photo book has been a huge hit! If you're like me and love the idea of scrapbooking but lack the follow-through, making a digital scrapbook is the perfect way to keep layout and organization easy and hassle-free. No trimming photos by hand or hunting for the glue stick — just drag and drop, and you're done! You can even customize with captions and text. Some great ideas for photo books include a petite brag book for the grandparents to carry around, a coffee table book of baby's first year, an illustrated retelling of your birth story, a beautifully arranged album of wedding photos, a memento of a recent trip or family reunion, a collection of pictures that speak to you about a particular time or subject, a portfolio of your favorite photographs, a gift for a dear couple on a special anniversary, a memorial to a departed loved one, a preservation of family heritage, or whatever else you can think of to commemorate! The reason we're ending this giveaway so very soon is that it does take some effort to organize and edit your photos, learn the Picaboo software, and arrange everything to your liking before sending it to be published. Since the ground shipping cutoff (for holiday delivery to the continental U.S.) is next Tuesday, Dec. 14, we're ending the giveaway this Friday night, Dec. 10, to give the winner plenty of time to craft a masterpiece over the weekend! Save 30% on any Classic photo book or calendar order until December 30. Use code HOLIDAY30. Get 15% off all customized photo cards. Use code GREETING15 by December 30. Classic photo books start at $6.99, and Picaboo has many other stunning premium design options available, including Madison (featuring full-bleed covers), Victorian (featuring velvet covers), Modern (featuring pages that lie flat) and Flush Mount (the ultimate album for special occasions). Shipping starts at $7.99 for ground shipping to the continental U.S. for a medium sized photo book. For your own chance to win a Classic photo book from Picaboo, enter in the comments below! Contest is open internationally (more specifically, to any countries to which Picaboo ships), but winner pays all applicable shipping costs. MAIN ENTRY: Visit Picaboo (or cheat and look at the pictures above — I don't mind) and tell me which Classic photo book you'll pick if you win! Tell me what the subject of your photo book will be if you win. Visit Picaboo and tell me what your favorite product is besides the Classic photo book. Post this giveaway on your Facebook page or wall and leave the link. Enter another of my current giveaways or the giveaways on Natural Parents Network (1 extra entry per giveaway — check back for more, because they are coming every weekend). Winner is responsible for applicable shipping costs plus any additional pages or features. Contest closes December 10 at 11:59 p.m. PST. If I got a different Picaboo product, I think it would be the calendar. I've made calendars for family Christmas presents before and they are always happily received. I have never published a photo book. I need to, tho. We've been digital for about 8 years, so we don't have very many, if any, pics from my first pregnancy onwards and I've always wanted to make a digital scrapbook and publish it. I'm a subscriber to Hobo Mama Reviews via RSS! The book would focus on the first year (or two) of our daughter's life. I checked out Picaboo's other products and the calendar's appeal to me - we've been intending to do a collaborative one with pictures of all the grandchildren for my parents but haven't got our act together the past couple of years and haven't even discussed it yet this year. While I do intend on pulling together two photo albums (one for each set of grandparents) with photos from the past year or two - the photo book would be ours to keep. I'd create a Classic Linen with die-cut window in brown or cream color! So classy - so beautiful! Id' like to make a custom cover book using my digital scrapbook pages. foster2forever at my gmail acct. The book would be my pregnancy and little baby--he's our first, and we have loads of digital photos, but none printed! I haven't ever done a photo book before, but my stepdad did one for his wedding to my mom, and I loved it. I would keep this one! But I might make another one to give to the baby's great-grandmother, who doesn't have internet. If I got another picaboo product, assuming there was time to get them before Christmas, I'd order some cards--probably the starry swirl ones. I like Hobo Mama on Facebook! I like NPN on facebook! If I won, I would choose the linen hardcover in green with hinged pages. Very nice! I love digital scrapbooking, but have yet to actually print a book, /sigh. Too many to choose from. I think if I won I'd probably go for the classic, though the custom one is tempting too. I think if I won I'd finally finish the ABC album I started for my daughter last Christmas. I think the Picaboo calendar would be my next favorite product. Although, I think the Madison photo book runs a pretty close second. I had a small photo book printed for my son with pictures of a birthday trip to see WWF. :-) He was very excited and still has it. I love their calendars! We are thinking of making a family calendar for ourselves this year. I like Picaboo on FB. I posted the giveaway and link on my FB page. I like Hobo Mama on FB. I like Natural Parents Network on FB. I started albums to print last year! I have an ABC book for my daughter close to done, as well as a book of our 2009 year that we were going to print copies of to give to family. Neither ended up actually getting printed though. I was pregnant at the time, and then had a newborn, and it was one of those projects that just never got finished. I follow Hobo Mama Reviews through Google Reader. 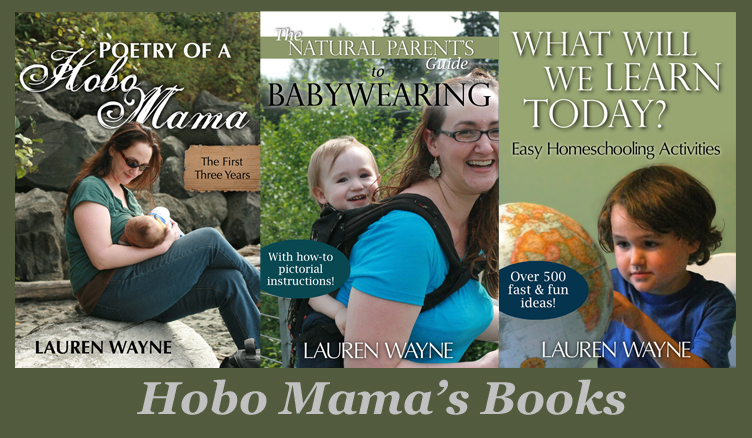 I follow Hobo Mama through Google Reader. I follow Natural Parents Network in my Google Reader. I follow PicabooBooks, my twitter name is attachedmama. I follow HoboMama, my twitter name is AttachedMama. I follow Natural Parents, my twitter name is AttachedMama. I would get the Classic Custom book, I like the fact that I can make a custom cover of one of my favorite photos for the book! The subject of the photo book would be my daughter's 9th birthday party coming up this weekend at the local bowling alley, a great way to commemorate the occasion with family and friends! I only have one other photo book, and it was from our vacation and my daughter's (better late than never) Baptism and party in Guatemala. If I were lucky enough to win, I would keep it of course! I would pick a chocolate colored one! If I won, I'd do pictures of my daughter for her to keep! I like Picaboo's Madison photobook! Gorgeous! I've never had a photobook done before, though I've seen them and they are aweseome! I would give it to my daughter! Well, it would stay on our shelf until she's older. And I subscribe to NPN in my reader! I like the classic leather book (smooth finish please!). I'd do a photo montage of our 2010 memories. The calendars look like a lot of fun. I just put together a book for my little one's grandparents for the holidays. I'd keep this book for myself. I would likely pick the classic leather for my family. i really like the red classic linen! add http://www.HoboMama.com to your text blogroll for 2 extra entries each. last year i made photo books of my son's first year. so i would probably use this one to make his second year! I like Picaboo on Facebook, too. Also, I follow you on twitter (@Adelas), which is how I heard about this! aaaaand I also follow PicabooBooks (@Adelas).